Good Morning everyone! It's Saturday and time for another Sweet Stop Sketch. I really like the sketch this week and feel like it will be one of my go-to sketches in the future. You can go clean and simple with it or more complex if you like. I stamped the floral blossom from the "Your Friendship" stamp set twice and fussy-cut them out to make flower embellishments. 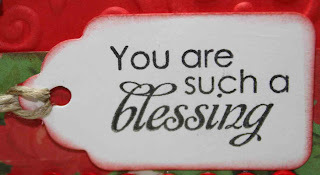 This is just one of the many great sentiments in the "Your Friendship" set. Hi Jennipher! Sorry to say it's been a while; But I can see you are as creative as ever! Your card is lovely and the sketch is wonderful! I love the bright colors you chose and the texture from the embossed background. The rhinestones add the perfect amount of bling. Gorgeous! Bright and cheery! This is a great design and I love the little tag at the bottom with the sentiment. Oh I LOVE the bright red...it's gorgeous!! The embossing and the bling make it POP!! I love your take on this sketch. Hope you are having a wonderful weekend. Just beautiful! Love all that red, and yes, I DO love that sketch! Fabulous card. Beautiful card Jennipher. Love the great textures, images... and pretty colors. Gret job with the sketch. It was a tough one for me this week. Glad to hear your mom is back to normal and it was a medication, not something more serious. Very pretty Jennipher! I agree those colors really pop! This is beautiful Jennipher!! I love the deep red colors! Gorgeous papers and flowers! 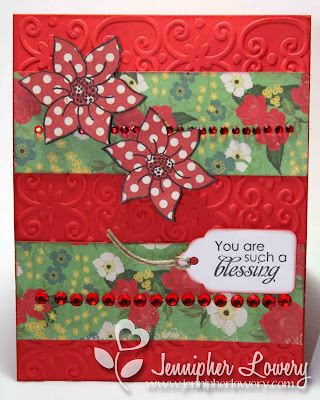 Beautiful card, Jennipher! 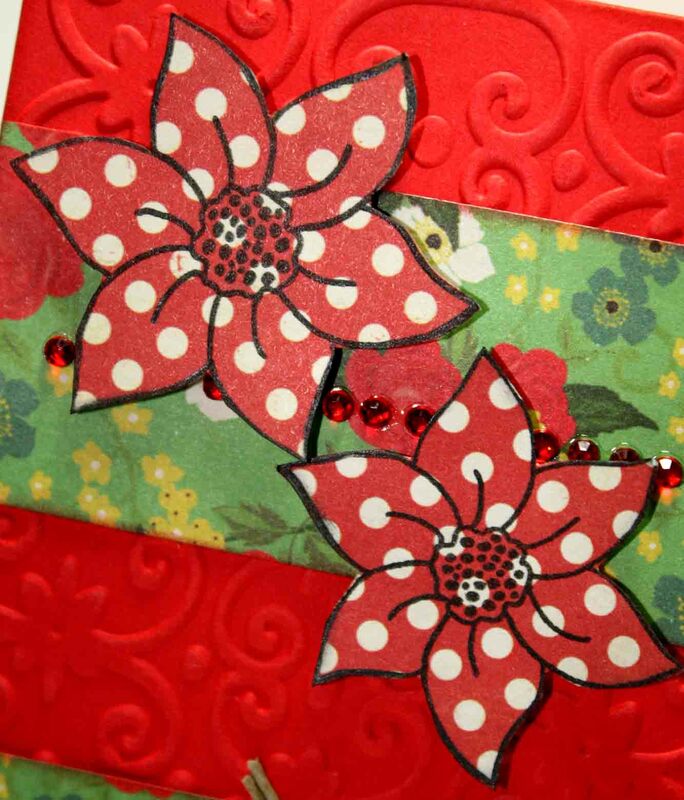 Love the texture on the red background, the bling, and the paper pieced flowers! Lucky the person who receives this cheerful note of encouragement! Really great sketch, and I love how you interpreted it! The red really draws the eye, especially with that lovely embossing, and it looks great with that pp. Love the bling, too and those lovely flowers. This is so pretty!! I just love the bright colors and the embossed background. It all goes so well together. Beautiful card. Great card and I love the polka dot flowers! so pretty. Great sketch & love your card Jennipher! Very nice work Hun & TFS!!! Those polka dot flowers look great on that embossed red background, and the bling makes this so festive! I love the sentiment done on a tag! Just beautiful! gorgeous as always! I love that pure poppy so rich! Hi Jennipher, your card is stunning. The red is so vibrant and beautiful. I love the flowers and their white polka dots, so pretty. Oooohh, I love your paper piecing and bling! This is so beautiful! 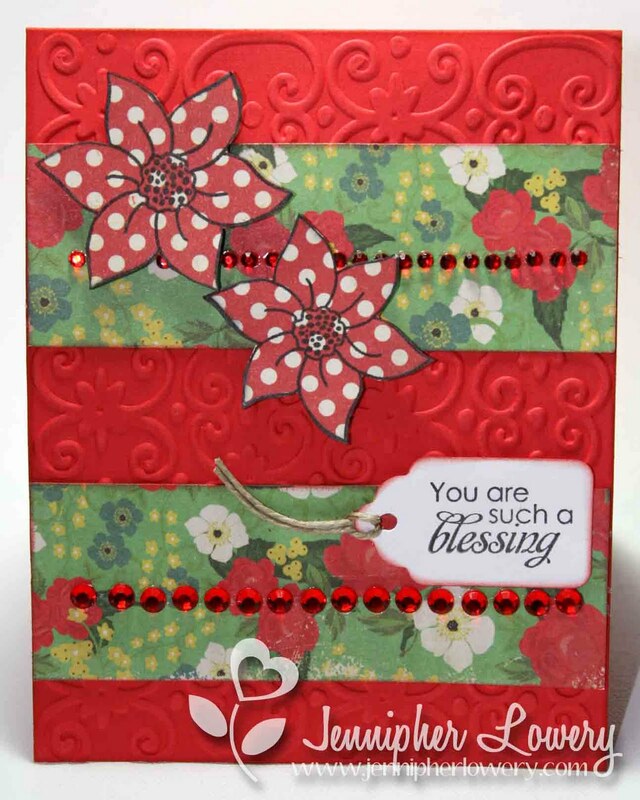 Love your choice of colors for this card!